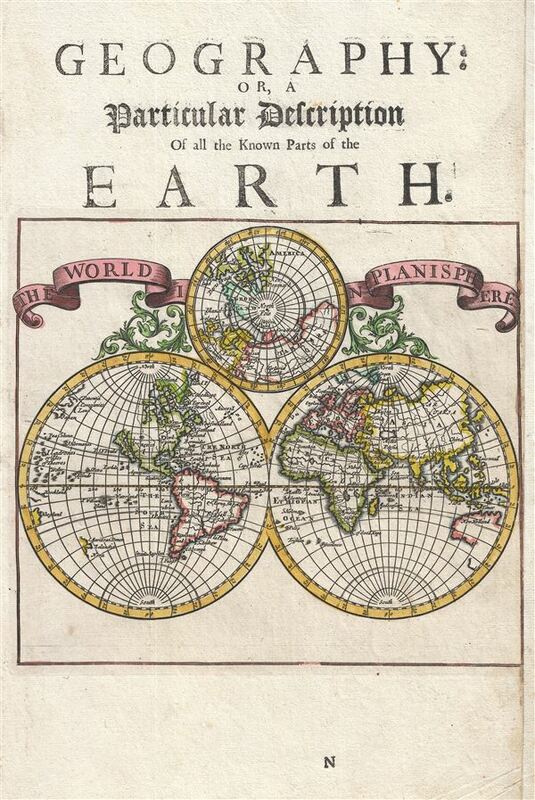 This is a scarce 1701 map of the world in hemispheres by Herman Moll. It depicts the world on a hemispheric projection and the map of the northern hemisphere with polar projection centered on the North Pole. The map features much of note including a presentation of California as an Island and early speculative mappings of Australia, Tasmania and New Zealand. Moll boldly presents California in insular form on the Luke Foxe model popularized by Nicholas Sanson in 1657. Luke Foxe as an English navigator who lead a 1631 expedition in search of the Northwest Passage. Although he had no luck in his hunt, his expedition lost no lives, which is a feat for early explores in Arctic waters. The maps associated with his expedition featured a surprising illustration of California in island form. It was Foxe who is credited with introducing the curious form of northern Insular California, including the Bay of Talago, the Rio de Estiete, and the unusual peninsula extending from the mainland, Agubela de Gato. The origin of this cartography beyond Foxe remains a mystery given that Foxe himself never sailed anywhere near California. Baja California was subsequently discovered in 1533 by Fortun Ximenez, who had been sent to the area by Hernan Cortez. When Cortez himself traveled to Baja, he must have had Montalvo's novel in mind, for he immediately claimed the 'Island of California' for the Spanish King. By the late 16th and early 17th century ample evidence had been amassed, through explorations of the region by Francisco de Ulloa, Hernando de Alarcon and others, that California was in fact a peninsula. However, by this time other factors were in play. Francis Drake had sailed north and claimed 'New Albion' near modern day Washington or Vancouver for England. The Spanish thus needed to promote Cortez's claim on the 'Island of California' to preempt English claims on the western coast of North America. The significant influence of the Spanish crown on European cartographers caused a major resurgence of the Insular California theory. Eusebio Kino, a Jesuit missionary, traveled overland from Mexico to California, proving conclusively the peninsularity of California. Across the Pacific Australia, New Zealand, and Tasmania are presented in very speculative form referencing the voyages of Abel Tasman. Australia is identified as New Holland. Only parts of Australia's northern and western shores. Similarly, only the southern shores of Tasmania are identified. New Zealand is even more speculative and only its western shores are noted.